Anyone can get a flea problem. No matter how advanced/safe flea products become, people can be lax about treatment. Letting things get out of hand is cruel. In many parts of the country, fleas have been ramping up, possibly under your radar, since the warm weather began. Now you may have a flea problem that doesn’t have an easy fix. Anyone can get a flea problem. No matter how advanced and safe flea products become, people can be lax about treating their animals, and their pets and households become infested. If your pet is living in a flea-endemic area and you don’t use prevention, your pet probably will get some fleas. If you let the infestation get out of hand, you will most likely have to use more flea products on your pets, and probably have to treat the environment. You may also have to treat itching and skin infections caused by the fleas. I don’t like to see people forced to use products they don’t like, or spray their home with insecticides. If you begin to check your pet early in the season, or in warm climates, all year round, you may be able to stave off a big problem. There is no highly effective natural flea prevention if nature deals us a bad flea year. Dr. Susan G. Wynn, my hero when it comes to natural and alternative veterinary medicine, agrees. Dr. Wynn recommends flea combing your pet twice a day, every day for months, and using a product like Fleabusters in your house if necessary. She also suggests bathing your pet weekly. “Natural” flea sprays need to be reapplied continuously, in her opinion, making them fairly useless. Essential oils can be toxic to your pet. Some create skin eruptions, or can be toxic when ingested with normal grooming. I find the odors from many of the “natural” products so offensive, they may upset your pet as well. All this, and they don’t work well. If you roll with the alternative and natural folks, be vigilant early about fleas and you may be able to avoid more conventional flea treatments. Does Garlic Prevent Fleas? No. 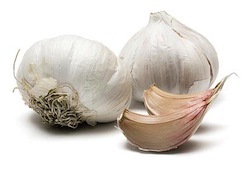 Garlic does not prevent fleas. Garlic can make your pet sick, but the fleas living on him will be just fine. Healthy pets are not immune to fleas. Although it is true that pets in poor health are more prone to parasites, I’ve seen thousands of healthy dogs and cats, fed a superb diet, crawling with fleas. Fleas are not choosy. They bite the healthy, the young, the old and you. Fleas can happen to the best of us, the worst of us, the smartest of us, the most informed and uninformed of us. If you are finding fleas, you need a plan to get rid of them. “Natural” does not equal safe. Garlic may sicken your pet, but it won’t kill fleas. There is no such thing as a small flea problem. Early intervention will ensure your big flea problem does not get bigger. 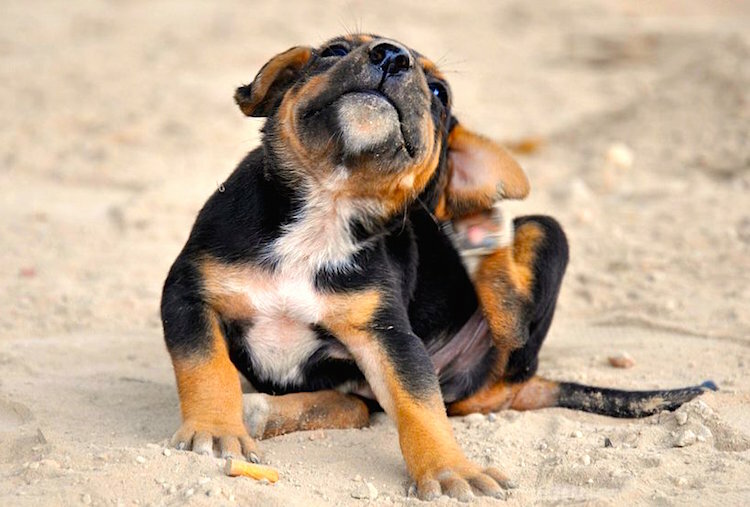 Fleas can come from your yard, feral and wild animals, or the dog park. People can bring in “hitchhiker” fleas to indoor pets. “Only the dog goes out, so I’m not treating my indoor cats.” Bad idea. Cats are fabulous reservoirs for fleas. If there is a flea problem in the house or on the dog, all pets should be treated, even if you don’t see concrete evidence of fleas on all the pets. “I never had a flea problem before this year, so this must not be so bad.” Wrong. For whatever reason, a flea problem can just happen. Treat quickly and aggressively, even if you believe you have not had fleas before. “That stuff you sold me doesn’t work.” A flea product recommended by your veterinarian is probably an effective product, whether you bought it online, at your vet’s office or over the counter. No flea product is 100% effective, particularly if you have used it only for 1 month or so. You will need to treat everyone for a longer time. You may also have to treat the environment. It’s not all that easy to find fleas. But in the past week, I’ve found fleas on 10 animals. None of the pets’ humans knew they had a flea problem. Buy a flea comb. They are worth their weight in flea gold. 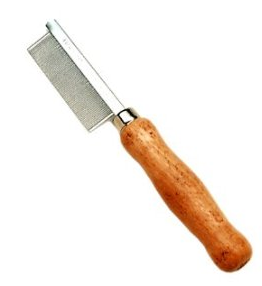 Get a plastic one for 99 cents or invest in a flea comb with a wooden handle for a few bucks. And use it! Comb through your dog or cat. See if you find a flea or flea dirt. What the heck is flea dirt? It’s flea feces. Yup — flea poop. If you comb your little varmint and find some black specks, collect them and dot them onto a wet paper towel. If the little peppery specks leave a reddish to orange/brown color on the paper towel, this is flea excrement. The red spot is digested blood in the flea poop. If the black speck leaves nothing but a little gray or black spot, it’s just driveway dirt. Veterinary dermatologists believe that at least 50% of scratching dogs and cats are flea-allergic. This means that if your animal has atopic (allergic) disease, flea control should be in place for most or all of the year. Flea allergy adds to or causes the greatest degree of scratching, biting, hot spots, and fur pulling in dogs and cats. Devise a treatment plan that you feel comfortable with, but don’t waste your money on flea garbage products with false claims. Talk with your veterinarian. Buy products wherever you like — but get intelligent advice first. If your flea problem is truly out of control and you have an infestation, you may need to treat your home. Check out the video below by Dr. Wayne Rosenkrantz, DVM, DACVD. Dr. Rosenkrantz is a great dermatologist who does not want to use more chemicals than necessary. He is a big fan of the oral flea treatments, like Comfortis (available from your vet). There’s a lot of evidence-based research on the safety of the new oral and topical flea medications. As he states, these products are much safer than the sprays and dips we had to use in the past. I don’t use the oral medications much in my practice because they do not prevent ticks. Dr. Rosenkrantz practices in California, where ticks are not as endemic as in the Northeast. Check with your vet about the best options for your dog and cat. Finding the best product that addresses fleas, ticks, heartworm and intestinal parasites is the key. I realize these medications are expensive. That’s why your vet should be able to steer you in the direction that’s best suited to your pet and controlling the parasites in your geographical area. Why don’t people think they have to treat their cats for fleas? If they’re indoor/outdoor cats, they are highly likely to get fleas, more so than dogs. If they’re indoor cats living with dogs, they’re still likely to get fleas. 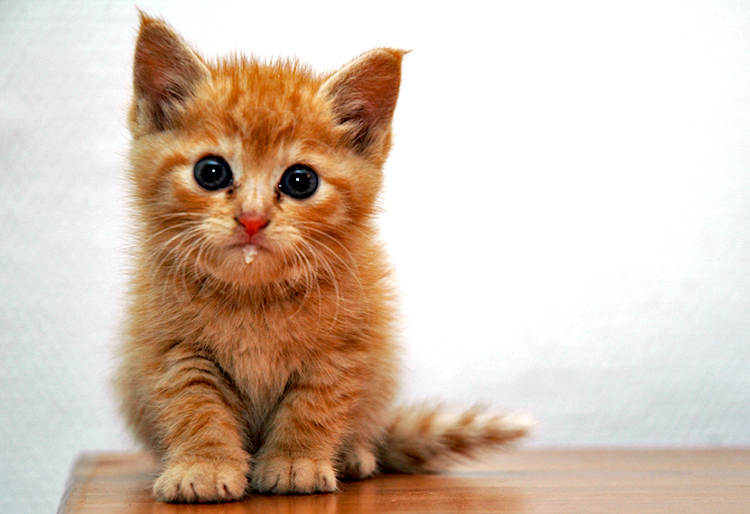 Cat like to eat fleas, so you may not find them as readily on your cat as your dog. That doesn’t mean they’re not there. If you’re treating your dogs for fleas and not your cats, the cats may be an in-house reservoir of live fleas. As Dr. Wynn recommends, flea combing your animals frequently during flea season will keep you aware of the severity of the problem. Look for those little black specks on your cat or dog’s abdomen or trapped in the flea comb. That’s probably not dirt from the driveway. That’s flea dirt (again, that’s just a nice expression for flea poop). I love flea combs. Get one with the nice wooden, brown handle. Or get a plastic one that costs fifty cents. And use it. Many pets like it. They’re great for grooming short-hair cats. But if you’re finding fleas at this time of year, or if you’ve been seeing fleas for several months, your prevention program has failed. Bottom line: Your animal is suffering. Letting your pet get so infested with fleas that they’re running across her face or your white socks is cruel. You don’t know about the white socks test? Clients like to brag to me that when they wear their white socks and they can see the fleas on the socks, it’s time to treat. No. It might be time to move! Many people still don’t seem to understand that having fleas biting your body constantly is horrible. Well, how about if I go outside, pick up some poison ivy, and rub it all over your arms and legs? Or just set you on a porch at dusk with 200 mosquitoes! 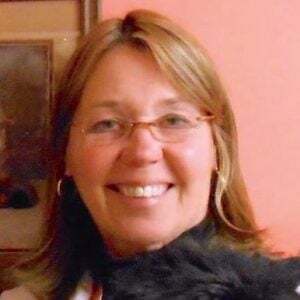 This pet health content was written by a veterinarian, Dr. Debora Lichtenberg, VMD. It was last reviewed July 29, 2015.